I’m playing along with the sketch #46 challenge for the first card and the Simon Says Stamp Wednesday Cut with 2 dies challenge on the second. Today I’m showing you two cards I created with different styles. Both are fun since I used my leftover die cut pieces from the first card to create the second. 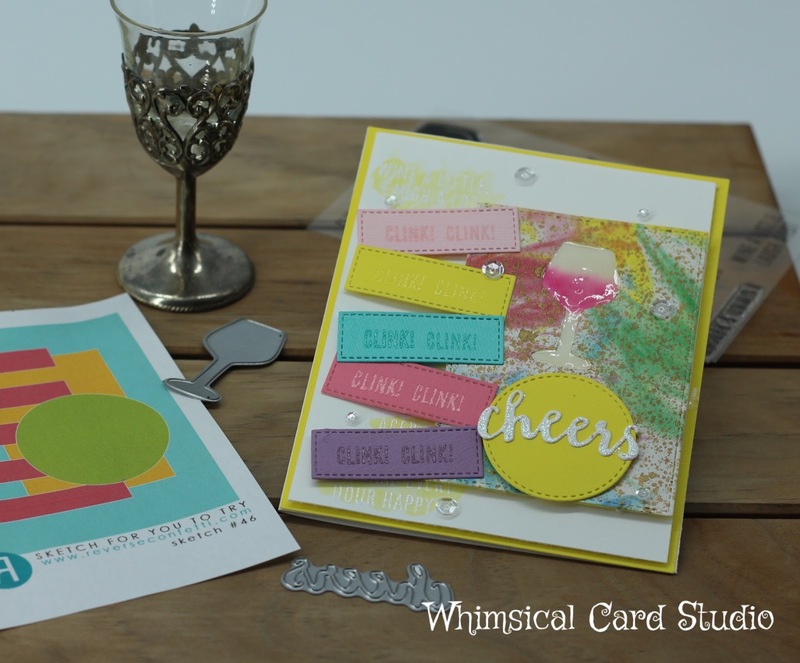 I like to stretch my supplies and re-using die cuts for different card is an easy way to do so. The rectangle die cut piece is a background I created with a shaving cream marbling method. If you’d like to learn more of the specifics involved, please be sure to give me a return visit this Saturday for a blog post all about a variety of backgrounds and a tutorial on how they were done. I created over 20 using various marbling techniques – some of which are easier than others. 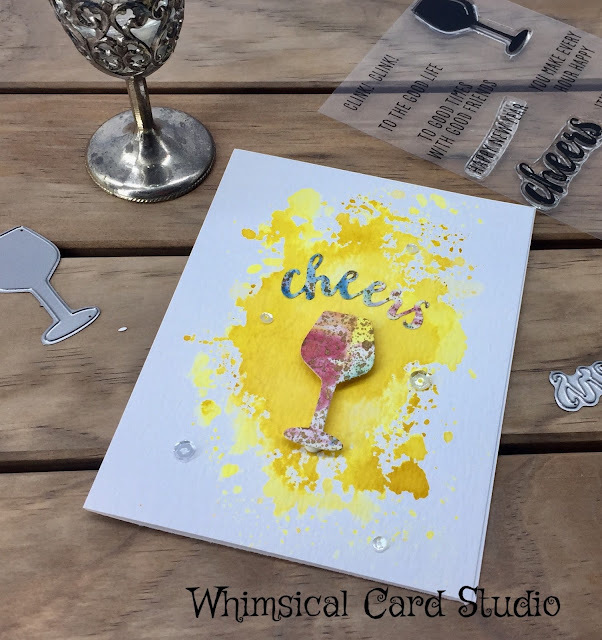 The original background was enhanced with Heidi Swapp spray ink in gold, then I used a rectangle stitched die to cut out the panel Next I glued the rectangle to a piece of heavy cardstock, then die cut out the wine glass and cheers die from Reverse Confetti’s wine die set. I put the wine glass and cheers word aside for the second card. 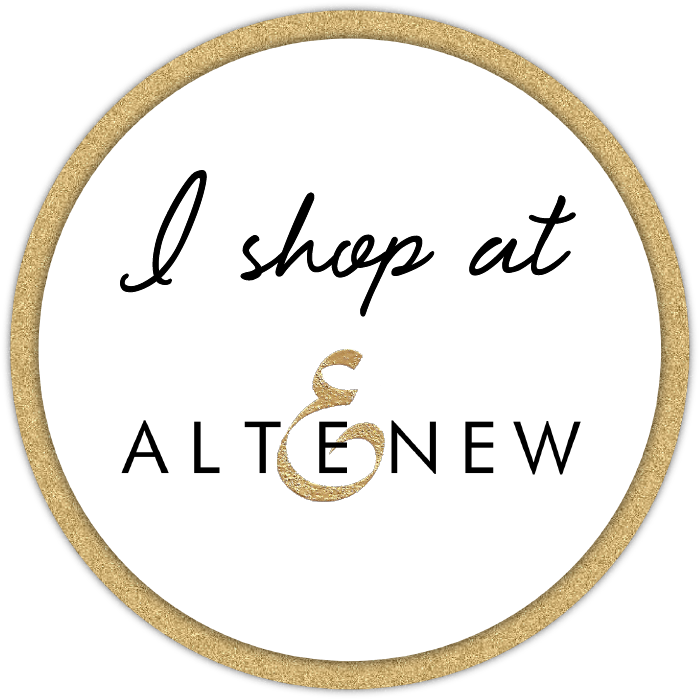 The cheers that I cut out was later concealed by the circle cut of yellow cardstock. The “wine” in the glass was done by cutting the wine die again on a piece of white cardstock, then I used a waterbrush to add color to just the bowl of the glass inside the die area, then attached this piece behind the window of the colored panel. This created just enough of a well to hold glossy accents. I love how this gives the wine glass a more lifelike appearance. The five “stripes” were cut from 5 different cardstock colors in coordinating colors, stamped with the “clink clink” stamp in Versamark and heat embossed with clear powder. It was the perfect touch to add interest. The base card panel had some interest added from stamping many of the remaining sentiments from the same set in versamark ink, white powder heat embossed and a bit of yellow watercoloring added using Distress Ink Squeezed Lemonade applied with a Kuretake watercolor brush. 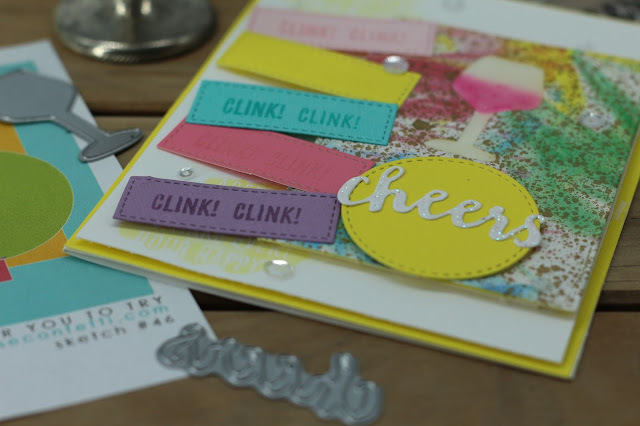 The card was assembled by popping up the rectangle panel on foam tape, then glued on the 5 small strips one by one, offsetting them a bit, then adding the yellow die cut circle, topped with the cheers die cut. I used Rangers stickles glitter to add a sparkly touch to the word cheers. To complete this card I added some clear sparkling sequins in two different sizes. I love it when creating a second card from pieces of the first make it so easy. I kept the background simple on this one. Using white watercolor paper, I used a smooshing method to create the yellow splashy background with 3 different Distress ink colors. I then popped up the wine glass die cut left over from the first project as well as the cheers die cut above it. I then glued the watercolor panel to a white A2 sized card base to complete. The best part of this is putting a card together in just minutes. 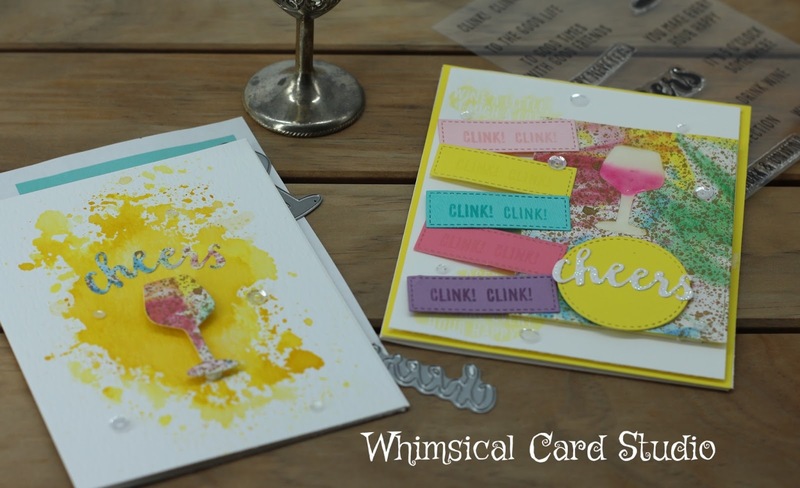 I hope you enjoyed taking a quick tour of my blog and checking out these two cards. As mentioned earlier, please be sure to stop by again this Saturday for my post on lots of background options and methods to create. 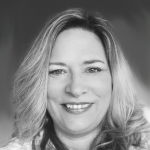 If you have found this inspiring, please consider leaving a comment!! I love hearing your feedback. Fun cards, Teresa! I love it when you can get 2 cards from 1 work session! Thanks for playing along with us at the Simon Says Stamp Wednesday challenge! Thank you Lin - glad you liked them!